December 30, 2017 - Like us now! Pakistan has great potential when we talk about the accomplishments of young innovators in the field of technology. 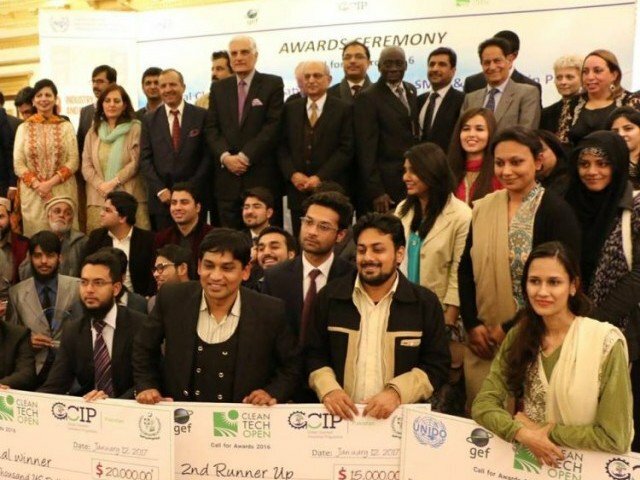 That’s why five awards have been given to the most promising Pakistani innovators in the field of the clean technologies by the United Nations Industrial Development Organization (UNIDO) under its Global Clean Tech Innovation Programme (GCIP). The clean technologies play an important role to counter the harmful effects caused by the increased intensity of climate change these days. Thus the need for encouragement and motivation to innovators working in this field has also increased. An award distributing ceremony was held in Islamabad to appreciate the efforts of the five most promising Pakistani innovators in the field of clean technologies. Five different categories were nominated by GCIP to reward the innovators. ‘Modulus Tech‘, the inventor of a new low-cost design of energy efficient houses was rewarded by the first prize. These houses can be assembled in just 3 hours, which means you can make cost-effective colonies within a month. The runner-up team ‘Biotech’ also came up with a good idea to make a dual function solar system for rural areas which can run water pumps and flour mills. The ‘Industry Challenge Award’ was awarded to ‘Bitsym Bitpredict’ which showed up with an industrial process of a fault detection information system. Another award was given to the ‘Crean’ which has developed the technology for the utilization and regeneration of old batteries. The specific award for the most promising team led by a woman was given to ‘Aerosync’ by the Islamabad Chamber of Commerce and Industry. The startup has come up with an idea for an innovative solar power cart which will be used by roadside street vendors. Over 200 high ranking officials, dignitaries, ambassadors, and international donating agencies attended the award distribution ceremony. The Country Representative of UNIDO Pakistan, Nadia Aftab also shared the agency’s vision on energy and environment in promoting clean technologies. The effect of global warming and climate change is increasing rapidly and scientists think that Earth might become a ball of fire after 600 years. Thus more efforts are required to get something out of clean technologies.